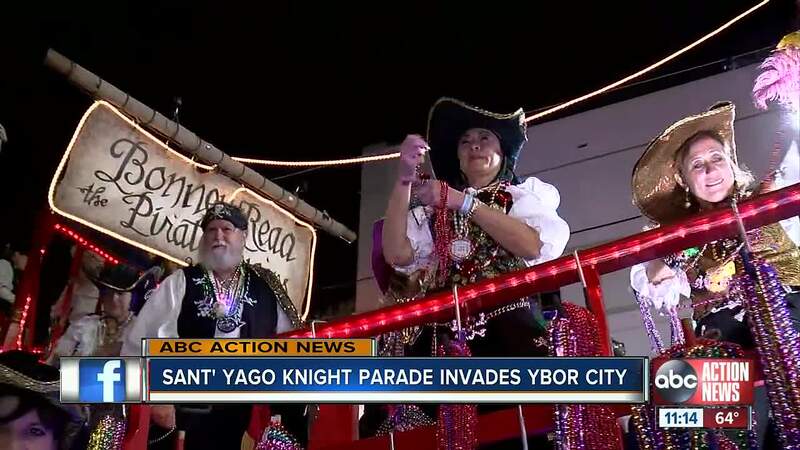 TAMPA, FLA - A long standing tradition continued tonight in Ybor City with the Sant’ Yago Knight Parade. Thousands of people lined Ybor City to watch the floats and catch beads. The parade started at 7 p.m. It lasted roughly 2 hours. People enjoyed illuminated floats and marching bands. Mayor Bob Buckhorn was this year’s Grand Marshal. “I love the music, the lights, and getting beads,” one spectator said. The event was free and open to the public. The parade celebrated Tampa's civic pride. This is the Knights of Sant’ Yago biggest fundraiser with proceeds going toward their education foundation. “I just....the fact you know catching the beads and being with the family and having something wholesome to do,” another attendee said. Hundreds of Tampa police officers kept their eyes on the crowds tonight before and after the parade. Chief Brian Dugan said the biggest challenge is that people don’t remember where they parked. “It’s after the event also that we’re going to have a large number a large presence of police officers out here. It’s about safety....safety in numbers and knowing where you’re going and having a plan,” Chief Dugan said.